Only two weeks of footy left with this weeks AFL Round 26 Preliminary Finals Tips 2018 setting the scene for this weeks post. Man, it’s going to be boring once the footy scene is over. Without further ado, let’s take a gander at my AFL Round 26 Preliminary Finals Tips 2018. This week’s bet all depends on whatever odds Ladbrokes is offering on this year’s preliminary finals. It looks like Melbourne are the underdogs in this year’s prelim finals, but I reckon they may have enough to shout down the crowds at the Optus Stadium. You can see proof of my bet here. 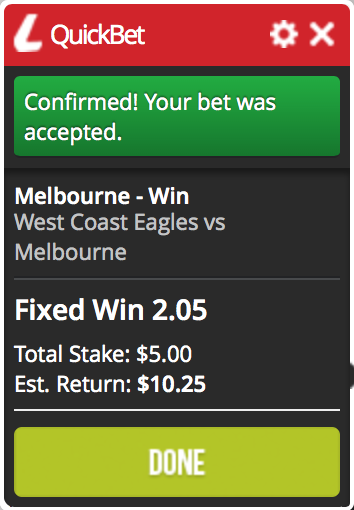 Once again remember to gamble responsibly because you just never how finals footy will turn out.